Almost everyday I tell the girls, "Practice makes Perfection. You have to practice <*> everyday if you want to be good at it". Into the wild card goes everything from math, piano, gymnastics to combing hair. By now they have heard it so often that they turn a deaf ear to my gyaan. Now I will let you on to secret. Though I give them this gyaan repeatedly, I don't always adhere to it. Definitely not when it comes to cooking. I mean look at it this way. I am an adult! It is not for nothing that I have grown up to pay monthly bills and worry about them. I need some leeway, some pleasure out of this whole growing-up business, something that will make my adulthood worth it. And that is not to achieve perfection. At least not in my kitchen. For to be perfect in cooking any dish, I need to do it again and again and again. That is B-O-R-I-N-G. And then who is going to eat that same thing tell me? b) the end product will not be so wild that it will be untouched by my house humans. 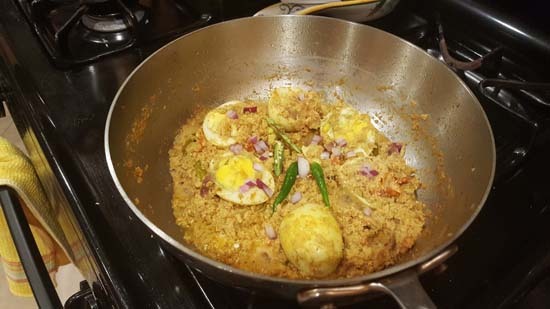 Following this line of thought, I made something different with eggs few weeks back. 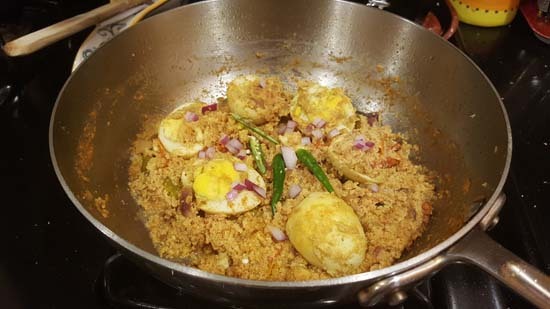 A Dim Posto Narkol or Dim Narkol Posto or Narkol Posto Dim or whatever that required eggs, posto aka poppy seeds -- a Bengali's favorite spice, and coconut. Now my mother did make a Dim Posto and even a Dim Shorshe posto, so technically I am not crossing uncharted territories here. It is just that this Dim Narkel Posto is, you know different! Try it. We loved it and even Big Sis who is no lover of eggs grudgingly admitted "Eita khub bhalo hoyeche"! She doesn't know about my personal policies on perfection yet. Don't tell them! In the neighborhood that we live, we have a lot of Indian neighbors, and as a result invites for Indian festivities like Haldi-Kumkum, Lakshmi-puja, or Kanya puja on Ashtami are in abundance. Most of these festivals are done by the women folk, who are very open with welcoming new people into their house or sharing their home-made goodies with others. Puri-halwa-kala chana on Ashtami days, sundal and small packets of haldi-kumkum on the Lakshmi puja days and boxes and boxes of delicious sweets on Diwali are shared with much love and joy. Now, although I celebrate Diwali with as much merriment as any other, making sweets on Diwali is not a tradition I grew up with. Very practical too, as we are done with our sweets like naru and sondesh making first for Bijoya Dashami, then Lokkhi Pujo and now we are prepping to make more for Bhai Phota. In between Diwali is when we light up candles, enjoy some fireworks, do Kali Puja and enjoy sweets gifted by other people!!! However this year, I wanted to share some Diwali gift with my neighbors too. I had already shared Roshogolla with them for Durga Pujo and it didn't make sense for me to make more sweets. I was enjoying the besan laddos and gulab jamuns that were piling up in my house. 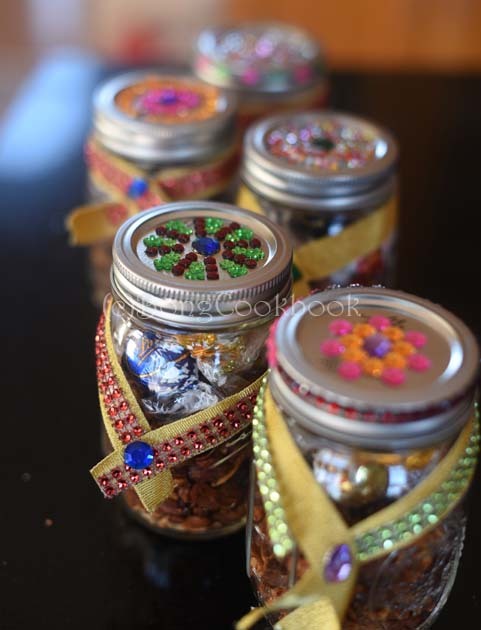 So I decided to gift them Diwali in a Jar!!! It all started with a 40% coupon for Michael's the craft store and the dozen Mason Jars that I brought home from there. It was to be my project for a relaxing evening. I would sip tea, watch some sitcoms and decorate mason jars. The plan was to put some Diwali trinkets and chocolates in the jar. The main focus was decorating the jars and me having a "relaxed evening". But did that happen as I planned ? No. Never does. The moment I sat down with all the bling craft jewels and the shiny ribbons, LilSis joined me. "I want to do one", she said. Well, so, yeah why not. She pulled away the jar from me and started sticking the jewels. I hovered around, hoping to guide. But she was doing a fabulous job anyway. Soon BigSis came downstairs and whined, "I never get to do anything fun. All I do is homework. I want to do this too"! Oh, boy! Here goes my jar and "relaxed evening", I thought. Both the girls sat around intently decorating the jars with so much enthusiasm and artistry that I did not have the heart to ask them to stop. So they decorated all the 12 jars, and did a beautiful job of it too. Meanwhile I roasted some nuts following this recipe. 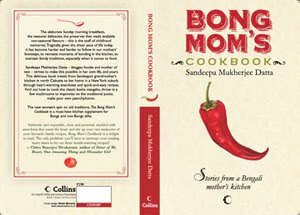 The only thing is I changed the spices and used all Indian spices like Bhaja Moasala and Chat masala. 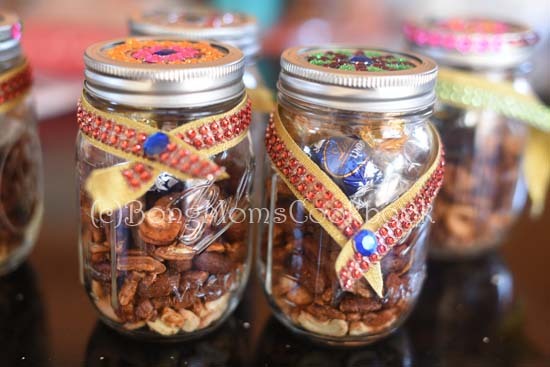 Once the spiced nuts were cool, we filled the jars with nuts and chocolates. 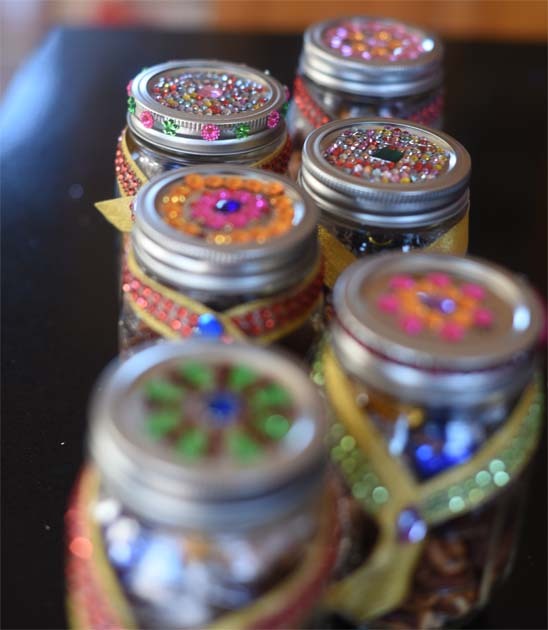 These sparkling jars filled with spicy nuts and chocolates was our Diwali gift for our lovely neighbors. I am hoping they had a good time snacking. Don't you think these would make excellent holiday gifts too? It is easy, simple and surely a keeper.